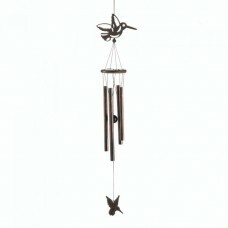 When the wind flutters through this beautiful wind chime, it will fill your ears with beautiful music. This wind chime is made from pine wood and iron, and it features a cutout hummingbird ornament on top and a lovely hummingbird charm below. 3" x 3" x 29"